Are you sure you want to know? 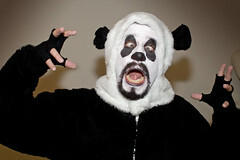 : Michael as a panda- grrr! It's Panda Week 2008.........Don't I look F-I-E-R-C-E? LOL!!! Yeah as fierce as the cowardly lion. If you're in Chicago you'd better be going to the Halsted Halloween Parade, it's gonna be off the hook this year and what a great way to kick off the weekend. I'll look for you, but it might be easier for you to find 3 giant pandas!